about an acorn that drops to the ground. So begins this warm and poignant picture book that follows a mama mouse and her baby mouse on the little mouse's journey to becoming a reader--from infancy, to toddlerhood, to elementary school, and beyond. When Mousie is little, Mama sings him lullabies about the sky, repeats back his DA DA DEES and BA BA BEES, and reads him poems and stories about wonderful things like forests and bears. Then one day, on a playground next to the library, Mousie sounds out a word, then two, then three . . . and a reader is born! Inspired by the American Academy of Pediatrics recommendation to read aloud to your children from the day they are born, here is a charming picture book that celebrates families reading together. RACHAEL COLE is the author of CITY MOON, winner of an Ezra Jack Keats New Writer Honor. It was called "wonder filled and delightful" in a Kirkus starred review. She is also the author of LADIES DRAWING NIGHT, published by Chronicle in 2016, along with Leah Goren and Julia Rothman. She is the art director at Schwartz & Wade Books. Visit her on the web at rachaelcole.net, on Instagram at @rachaelcole, or on Twitter at @rachael_cole. MELISSA CROWTON recently received her master's degree from Maryland Institute College of Art in Baltimore. 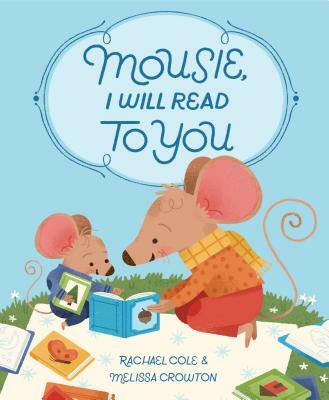 Mousie, I Will Read to You is her debut picture book. Visit her on the web at melissacrowton.com and on Instagram at @mcrowton.